It's that time of the year again admission in different educational institutions is going on full swing. Along with admission for formal courses, students are also found to be interested in going for distance learning which enables them to do a job or indulge in other works even while pursuing a degree. For them, Indira Gandhi National Open University (IGNOU), is a boon that allows completing the desired goals without attending classes on daily basis. So here in this article, we have mentioned all the details regarding Open and Distance learning (ODL) from IGNOU, Delhi for the July 2018 academic session. Established by an Act of Parliament in 1985, IGNOU has continuously striven to build an inclusive knowledge society through inclusive education. It has tried to increase the Gross Enrollment Ratio (GER) by offering high-quality teaching through the Open and Distance Learning (ODL) mode. It serves the educational aspirations of over 3 million students in India and other countries through 21 Schools of Studies and a network of 67 regional centers, around 2,667 learner support centers, and 29 overseas partner institutions. Over the years, IGNOU has lived up to the country's expectations of providing education to the marginalized sections of society. Free of cost education is being provided to all jail inmates across the country. A large number of SC/ST students have been admitted to various programmes of the University. It offers 226 academic programs comprising courses at certificate, diploma and degree levels. On May 20, 2018, IGNOU announced admission to its various Bachelor and Master's degree programmes and the last date of submission of online admission form is July 15, 2018. MA programmes which are offered to the students comprise of subjects like Philosophy, Gandhi & Peace Studies, Development Studies, Anthropology, Gender & Development Studies, and Psychology, just to name a few. Before the admission, for students applying for MBA & PG Specialization Diplomas, IGNOU will organize an Entrance Test ‘OPENMAT-XLIII' that is apparently to be held on Sunday, the 24th June. However, students opting for Post Graduate Diploma Programmes are not subjected to go through this entrance test. Filled in form for Entrance Test ‘OPENMAT-XLIII' must reach, the Registrar (SED), IGNOU, Maidan Garhi, New Delhi, by Registered Post/Speed Post on or before 1st June 2018. Note that the last date for fresh admissions in Certificates and Diplomas is 30th June 2018. 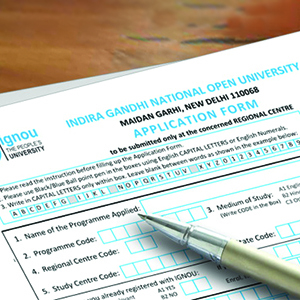 IGNOU provides the facility for online admission form fill up along with the availability of forms in regional centers where students aspiring to take up a course can simply obtain admission form through the official website www.ignou.ac.in and do the needful steps. The duly filled application form should be attached with payment challan, certificates of educational qualification, age certificate, experience certificates (if any) and category certificates for SC/ ST/ PH/ OBC/ Kashmiri Migrant/ War Widow (if applicable).